cards, Classes, Stamp At Home Kits, Stampin' Up! At card class this Saturday we are going to create some sweet cards using the Thoughtful Branches Bundle. This is a great opportunity for you to play with it. Here are the details. If you can’t make it, card kit details are below. We will create some different cards using the set PLUS there will be other samples on display. WHEN: Saturday 13th August 2pm at my studio in East Corrimal. COST: $15, or $20 to use my adhesives. Buy the bundle and get the class FREE! Please RSVP by Thursday 11th August. Here are the cards we will be making. Hope to see you there for some stamping fun. Let me know by emailing me or leaving a comment and I will get back to you. Are you too far to come to class or you can’t make it?? Why not get the Card Kit? You will need the Thoughtful Branches stamps and dies which you can order additionally from me. CARD KIT TO STAMP AT HOME: $15 Includes all materials but no stamped images or adhesives. You can order this Bundle directly from me OR through my store. Order HERE at my store. Bundle price is $90.50. Australian residents only. **BONUS** – Receive a PDF of some bonus projects PLUS receive 2 VIS (Loyalty) points when you purchase this from me. Here is a reminder of the stamps and Dies for you. PARTY POP-UP’S CLASS OR KIT TO GO! I have an exciting class coming up next week. We are using the Party Pop-Up Thinlits from the Occasions Catalogue. If you can’t make the class (which is a little sad by the way as we do have a lot of fun), you can grab the Kit. We will be using the Thinlits in 3 different ways. Please RSVP by Thursday 10th. COST: ** NOTE DIFFERENT CLASS OPTIONS. c) Kit Only: Can’t make the class? Purchase the kit which contains all card and embellishments and cut Thinlits (excludes stamped images). Also includes instructions. $20. PARTY WISHES BIRTHDAY CARD CLASS!! 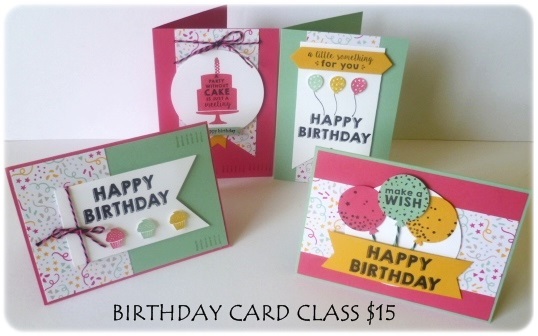 Join us for this fun Birthday Card Class using the Party Wishes Bundle. If you can’t make it, then you can order the kit and have it sent to you. Here are all the details. Saturday January 16th 2pm. Birthday Card Class. We will use the Party Wishes Bundle to make a set of birthday cards. We all need birthday cards right?? Here they are for you. Get the Party Wishes stamp set and the Party Punch Pack. Get the Class FREE. $68.50 Wood Mount or $56.00 Clear Mount. (Prices include shipping and handling). TO ORDER THE KIT (Australian residents only). If you can’t attend the class then order the card kit. Includes all cardstock and twine. Stamped images are not included. You can order the Bundle separately or substitute the stamps. Order the Bundle: $15 (kit) + Wood Mount $71.20 or Clear Mount: $59.45 (Includes shipping and handling). WATERCOLOR WINGS STAMP A STACK BY MAIL! This Friday is my next Stamp A Stack Class. If you are local I would love to see you. Here are the details. But if you can’t be here then read on further. RSVP Thurs. 25th Cost: $15 BYO: Scissors and Adhesives. Bring a Friend I haven’t met and you get 2 FOR THE PRICE OF 1! Here are the cards we will make. I know that life is busy for many people or because of distance some people can’t make it so I have now made the class available by mail FOR YOU!! Receive card kits for class cards to make in your own time. Includes card pieces to make 6 cards (3 each of 2 different designs). Card cut to size and includes ribbon/thread. You provide the stamps, inks and adhesives. Embossed pieces can be done on request. Stamped images cannot be included as per Stampin’ Up! policy. Stamps – Substitute your own or order the stamps in addition + SHIPPING. So now you don’t have to feel you miss out. Please RSVP for the class ASAP or comment that you will like to join the Stamp A Stack by Mail. cards, Stamp At Home Kits, Stampin' Up! Just a quick post today to show you a Christmas card I made recently. I’m not going to tell you too much about this card today. I was inspired by a card I saw on Pinterest I think. I’m giving you a little sneak of one of the cards in my ‘Stamp At Home’ card kits this month. For the full details head over to my blog post here and read all about it. Order your card kit to make 2 of these cards, 2 of a second design and one Fun fold Christmas card. These kits have had a huge response since I launched them last month so join in this month. Drop me a message or email to order your kit that you can complete in the comfort of your own home. SEPTEMBER STAMP AT HOME KITS AVAILABLE! Christmas is not far off so it will be great to get started on your Christmas cards this month if you haven’t already done so. Your Stamp At Home Kits this month includes card and embellishments for 5 cards – 1 Fun Fold card and 2 each of 2 different design cards. Take the guess work out of creating your cards. Includes all cardstock cut and scored to make 5 cards and ribbon is included. All you need is the adhesives. PLUS receive the ‘Evergreen’ Stamp set. Includes all cardstock cut and scored to make 5 cards and ribbon is included. All you need is the adhesives. $15 + $3 Postage. Drop me an email or a comment if you would like to order a kit. These are available until October 4th.